Philosopher George Santayana famously said, “The one who does not remember history is bound to live through it again.” This summer, I did just that when I had the incredible opportunity to step back into the not-so-distant past and explore one of humanity’s darkest chapters in history, to bear witness to the best and worst of human nature. The Holocaust was part of a vast operation in genocide which, between 1939 and 1945, caused the deaths of six million European Jews. During their twelve-year reign, Adolf Hitler and his anti-Semitic Nazi Party systematically targeted, persecuted and exterminated over eleven million people they deemed “undesirable.” These were individuals and entire groups of people who did not meet the Nazi criteria for racial purity in Hitler’s planned creation of a superior Aryan race. The primary targets were Jews and the Slavic peoples, while others, including Roma gypsies, Jehovah’s Witnesses, homosexuals and communists were exterminated because they were deemed inferior and poisonous to the German nation. Holocaust survivor Bill Glied speaks to the teachers on the tour. 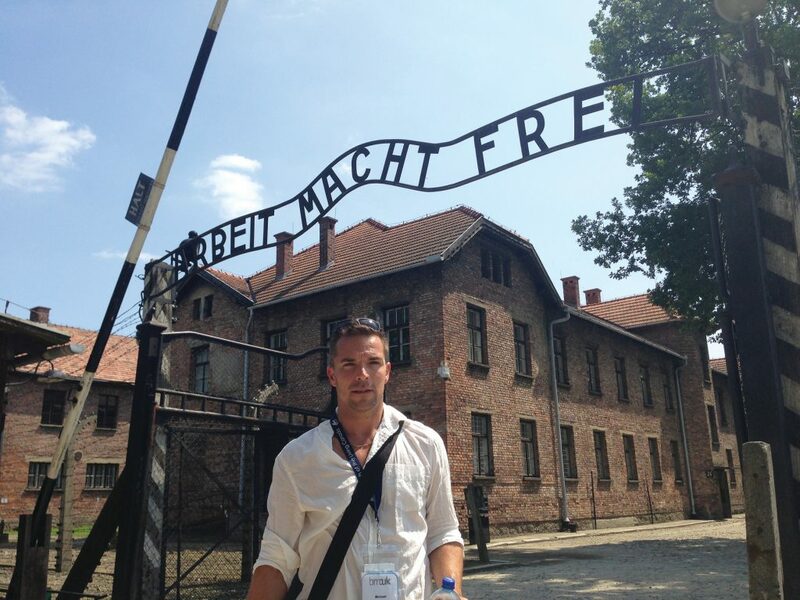 From July 2 to 12, 2013, I joined a group of twenty other educators from across Canada on a comprehensive, and what inevitably became an emotional, Holocaust Study Tour. The March of the Living is an initiative of the Sarah and Chaim Neuberger Holocaust Education Centre in Toronto which, through its museum and programs, generates knowledge and understanding about the Holocaust and serves as a forum for dialogue about civil society for present and future generations. The biennial March of the Living, funded in part by private donors, is a unique educational program that brings teachers, teacher candidates and faculty to sites of Jewish memory in Austria and Poland. By visiting historic sites of destruction (Auschwitz-Birkenau, Majdanek, Treblinka, Plaszow, and Mauthausen), of Jewish culture (Lublin Yeshiva) and of rescue (Schindler’s Factory), participants are given the opportunity to actively encounter living history. These encounters are supplemented with pedagogical methods and expertise to enable participants to teach about the Holocaust in new and meaningful ways when they return to their classrooms. 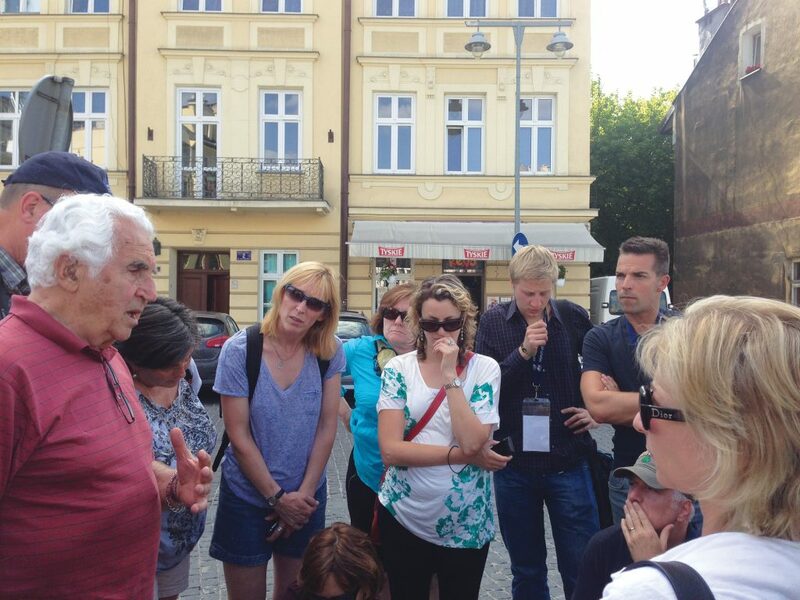 Over the course of ten days, our group of middle and high school teachers traveled to five former Nazi concentration and extermination camps in Austria and Poland, met with scholars and experts in Holocaust education, and heard first-hand accounts from individuals who witnessed those terrible events during World War II. The tour began in Vienna with visits to Jewish museums, meetings with officials of the Austrian Ministry of Education who shared their teaching resources and approaches to Holocaust study and with representatives of Centropa, a Jewish historical institute dedicated to preserving twentieth century Jewish family stories from Central and Eastern Europe and the Balkans. As I stepped down the long stone corridors, I thought, if these walls could talk they most certainly would scream at the atrocities being committed here—lives forever erased with a physician’s signature, their very existence wiped from people’s memories. The memorial site is well-preserved and comprehensively shows and tells what occurred here between 1940 and 1944. To learn that 30,000 people were murdered within these walls simply because they were physically or mentally handicapped was unsettling and further contributed to my moral struggle to understand human behaviour; how people could treat others with such indignity and total disregard for the sanctity of life? Crossing the border into Poland, I couldn’t help but become a little overwhelmed by the prospect of visiting the most notorious Nazi death camp—Auschwitz-Birkenau. Situated in the quaint town of Oswiecim, the local population of 15,000 was unaware of the infamy their quiet village would attain when, in the spring of 1940, SS soldiers moved in and began construction of the largest killing centre in the world’s history. Divided into three sub-camps, Auschwitz spanned 40 square kilometres, estimated to be the size of approximately 5000 football fields. But no amount of reading could have prepared me for the flood of emotions that consumed me upon my arrival at Auschwitz. Wandering the hallowed grounds and seeing the mountains of shoes, human hair, and other personal effects that once belonged to victims was incredibly humbling, but disturbing. Walking along the railway tracks where millions were selected to either live or die or chosen for medical experimentation, stepping into the barracks that housed up to 200 individuals in shared bunks of eight to ten people, being escorted through the central symbolic image of the Holocaust—the gas chambers and crematoria, suddenly made everything I ever read and studied very real. By 1944, up to 6,000 prisoners a day were killed. A total of 1.1 million were exterminated here, with only 200,000 surviving to see liberation by the Allied Forces in 1945. Outside of Krakow, our group also visited Oskar Schindler’s Factory and the nearby Plaszow Concentration Camp memorial—the setting of Spielberg’s Oscar-winning film Schindler’s List. In Warsaw, the newly opened Jewish History Museum welcomed us for a private viewing. The museum is a state-sponsored education centre that tells the history of Jews in Poland. We also visited the old Jewish quarter and home of the former Warsaw Ghetto, which at its peak, confined 450,000 Jews. This year marks the 75th anniversary of the Warsaw Uprising—an attempt to confront and sabotage the Nazi killing machine by resistance fighters. Next stop was the small town of Tykocin, once a thriving home for Polish Jews, and Lopochowa Forest, where this town’s population was escorted by the SS, forced to dig pits and then execute people. 2,000 Jews died on this site in 1941. I was standing in the very place where thousands were murdered simply because they were considered inferior, undesirable, and unworthy of life. My time at the Treblinka Extermination Camp was spent in complete silence. This was a killing centre where nearly one million people were systematically murdered between July 1942 and November 1943. It was here that the enormity of this unprecedented tragedy in human history finally took its toll on the emotions. Intellectually, I tried to make sense of something that made no sense. Emotionally, I attempted to contemplate loss on such a grand scale, but had no personal experience of that magnitude to equate it to. How does one begin to comprehend the horrific actions of everyday men and women who were persuaded to commit atrocities for what they were told was the glory of the German people? How does one make sense of the silence and inaction on the part of bystanders, be it individual citizens or whole nations? If, as Elie Wiesel stated, “indifference to evil is evil,” how was it possible for so much evil to have thrived and, ultimately to have succeeded in destroying so many millions of lives? Endless questions, with answers that may never be found. Outside of Lublin, at the Majdanek Death Camp, one of the best preserved of all former camps, our group paid tribute to Holocaust victims in song and reflection. Traveling with our group was professor of Holocaust Studies from Hebrew University in Jerusalem, Dr. Sharon Kangisser Cohen who shared her knowledge and insight into this period and provided a thorough history lesson at every stop on the tour. She stressed the importance of looking at the Holocaust through the personal and individual stories of victims and survivors and not simply by a list of chronological dates and events. In the wake of destructions, large and small, immediate and more distant, we are often moved to draw lessons, perhaps as a vehicle to soften the blows of loss. Learning from loss extends the possibility of hope; it provides the thread from which a silver lining can be sewed. When studying the Holocaust, one can recognize all the potential that was lost when the Nazis carried out the mass murder of Jews; the future scholars, doctors and artists who didn’t survive and were robbed of the opportunity to make a contribution to their society. But, more importantly, we should be talking about the mothers and fathers, sisters, brothers and grandparents, the individuals whose lives were cut short simply because they were Jewish. The highlight of the trip was, by far, the presence of 88-year-old Bill Glied, a Holocaust survivor who now lives in Toronto. Born in Subotica, Yugoslavia, Bill’s life changed dramatically in 1941 when the Germans occupied his country. Jews were rounded up, first ghettoized, and then sent to Auschwitz. 15-year-old Bill never saw his mother again. He and his father were transported to the Dachau Camp outside of Munich in Germany. After witnessing and experiencing the treacherous conditions of life in a concentration camp, Bill was liberated by the Allied Forces on April 29, 1945. Sadly, his father died eight days earlier of typhoid fever. Bill immigrated to Canada in 1947 and today speaks regularly to school groups across Ontario. Bill’s story, to some degree has a happy ending. For millions of others, the story ended well before it was fully lived. Bill’s very presence, echoed by his heartwrenching accounts of suffering and perseverance and peppered with anecdotes, only served to make this journey back in time more relevant, more tangible. Marilyn Sinclair, Chair of the Neuberger Holocaust Education Centre, is the daughter of a Holocaust survivor. He spoke about his experiences to thousands of students for over twenty years. She echoes her father’s reasons for promoting Holocaust awareness. Marilyn says these messages can be explored in a number of different subject areas, including history, geography, literature, digital literacy, equity and inclusion and philosophy. 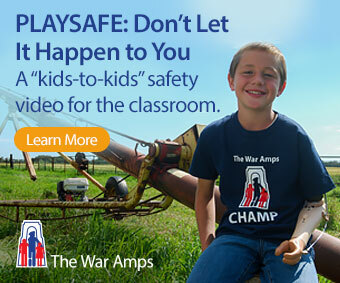 Such lessons include the imperatives to: defend the rights of minorities, speak out against injustice and oppression in all of its forms, safeguard the freedoms of democracy, question personal participation in bureaucratic systems, and fundamentally preserve the dignity and uphold the sacredness of all human life. Michael Luchka has taught in the public, Catholic and private school systems, specializing in the areas of English and Drama. He is currently developing curriculum resources with the Sarah and Chaim Neuberger Holocaust Education Centre.